Albany County is home to the state capital of New York and has a population of about 305,000. It, along with the three surrounding counties of Schenectady, Rennselaer, and Saratoga, form the region of New York commonly known as the Capital District. 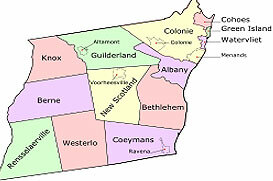 Founded in 1683, Albany County quickly grew to become the largest county in colonial New York. Today, while certainly not the largest, it still remains a major center of commerce and culture for the state as well as an exceptional place to live and work. Most importantly of all, Albany County offers variety. It is home to over a dozen towns and communities; large and small. From the urban feel of Albany to the more suburban atmosphere of Colonie, Albany County has a setting for nearly every lifestyle. However, even when the smallest town may begin to feel too crowded, residents of Albany County have the opportunity to escape to one of New York’s most stunning state parks. John Boyd Thacher State Park is over 2,000 acres of rolling forest and open fields. The park is open year round and allows visitors to partake in exciting activities such as hiking, skiing, snowmobiling, and mountain biking to name a few. So no matter where you live in the county, an exciting vacation is always within reach. When it comes to education, Albany County has no shortage of resources. It is home to 70 public schools and employs 3,165 teachers across 13 districts. And because of their proximity to the capital, schools throughout the area are always on the leading edge of improvements and implementation of state-of-the-art education techniques. So no matter where you are in the county, you can rest assured that your kids are receiving some of the best education New York has to offer. What makes Albany County exceptional lies within its character and its communities. Variety and diversity only *begin* to describe the exciting opportunities awaiting in this area’s towns and cities. Be sure to view our guides on specific areas and communities within the Capital District for more information on what this region has to offer you.